Hochschule Stralsund - University of Applied Sciences is a young and innovative campus university in the northeast of Germany. With its modern equipment, an excellent staff-student ratio and the fantastic position right next to the Strelasund, an arm of the Baltic Sea, HOST offers the best conditions for studying, research and quality of life. That’s why it regularly manages to gain top positions in German university rankings. Prospective students can choose from 27 accredited bachelor’s and master’s programs in German or English and one Diplom program. The programs on offer not only include traditional courses such as Engineering, Electrical Engineering and Business Administration, but also new and innovative programs such as IT Security and Mobile Systems, Motorsport Engineering, or Tourism Development Strategies. Currently approximately 2,200 students from 36 countries are studying at the three schools – Business Studies, Engineering, and Electrical Engineering and Informatics. That might not be as many as at other universities of applied sciences in larger towns – but apart from the clear practice orientation, it is above all the personal supervision that guarantees study success. And: the University does not just have a relaxed atmosphere, but also a family-friendly certification and it is fully accessible for disabled people. That’s what you call a HOST! HOST is one of the most important institutions for educating highly qualified experts in Mecklenburg-Vorpommern. Graduates of our excellently ranked programs are highly sought after, not just in our region, but throughout Germany and abroad. Nearly all the programs can also be studied as part of a dual program with a high amount of practice. To make this possible, the University cooperates with several companies. At the same time, with its practice-oriented research, HOST is an important impulse provider for the state’s industry. Studying in Stralsund has another important advantage: living costs are much lower than at several other university locations. Finding a cheap flat with a very good standard in the town center is no problem at all in Stralsund. At the same time, Student Services of course offer cheap rooms in the halls of residence. Highlight: the student village “Holzhausen” situated right on campus! Stralsund and the surrounding area provide excellent quality of life. The University can be seen from the Island of Rügen – Germany’s sunniest island. Not one, but two national parks close by enable fantastic nature experiences. The Hanseatic town of is a UNESCO World Heritage Site and an attraction for guests from all over the world. Lots of leisure activities and a rich cultural and party program make sure that the town is continuously expanding. You would like to gain an excellent degree and get to know an extra special place? 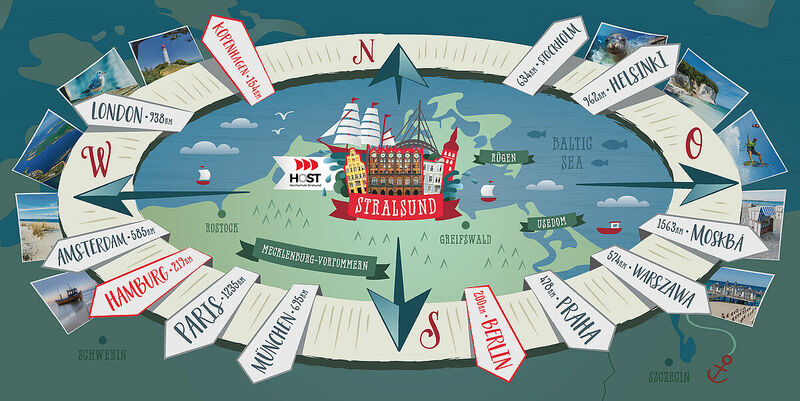 Come to Stralsund. We are looking forward to welcoming you to our cosmopolitan university! Let HOST be your host!